Expired (October 2017) is an exquisite new monograph by American photographic artist Kerry Mansfield that pays homage to the beauty and grace found in the collective and shared experience of time worn and well-read library books. The book's title is drawn from an official designation bestowed by a librarian upon a library book that is considered too damaged to be borrowed and read any longer. Some of these "expired" books are sent to be pulped and recycled, while others languish in storage or turn up in garage sales and on eBay. This is where Mansfield steps in. For her, the discarded library book is a relic to be cherished and revered. Over the course of several years, she embarked on a mission to locate expired library books across the country and bring them back to life through her photography. With meticulous composition and artful lighting, Mansfield lovingly illuminates every damaged detail elevating these aging books into permanent works of art. In her artist statement, Kerry Mansfield writes: "The volumes documented in 'Expired' serve as specimens akin to post-mortem photography in the Victorian Era, when family members only received the honor of documentation upon their demise. Each picture serves as an homage, calling out palpable echoes etched into the pages by a margin-scrawled note, a yellowed coffee splatter or sticky peanut butter and jelly fingerprints. It's easy to feel a sense of abuse and loss, but they say much more. They show the evidence of everyone that has touched them, because they were well read, and often well loved. They were not left on shelves, untouched." In Expired, we witness beauty and poignancy in the tattered edges, torn covers, broken spines, water logged pages, and other defects brought on by time and neglect. Mansfield also photographs the ephemera of the library going experience: the little paper check-out cards where alongside the stamped due date the borrower's signature signifies a sacred promise to return the book on time or face a fine, or, worse, a scolding from the librarian. The titles Mansfield captures range from the classics we love such as Harper Lee's "To Kill a Mockingbird," Dr. Seuss's "Hop on Pop," and "The Hardy Boys" series to more obscure books such as Evelyn Sibley Lampman's "The Shy Stegosaurus of Cricket Creek" and "The Flutes of Shanghai." After culling through thousands of books, Mansfield chose each title based on specific characteristics that she felt best displayed the love poured into library books over their years on the stacks. Currently, over 180 ex-library books have been individually photographed by Mansfield. Every book was carefully assessed, documented and alphabetically archived. The series is comprised of 175 photographs. The book presents 73 of these images. Mansfield still has over 75 books left to shoot and is planning Expired (Volume II). 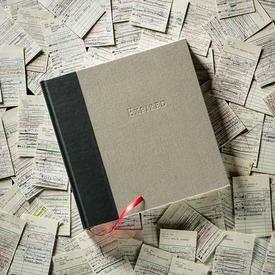 Expired is elegantly designed to have the look and feel of a novel. The book features a red ribbon page marker, a tipped in image on the back cover, and mounted on the inside of the back cover is a physical library check-out card that is signed by the artist on the author line and inserted into a pocket stamped "Expired." "We must take time to celebrate the swiftly disappearing communal experience offered by library books as they are being replaced by downloads, finger swipes, and plastic newness. If you listen carefully, you can hear the aching poetry -- the burden of the years that calls from their tattered pages," says Mansfield. Expired will appeal to art and photo book collectors, writers, avid readers, librarians, sociologists, and anyone who cherishes the fading emblems of our collective reading history.